When it comes to a compromise between DSLR performance and that of a standard issue digital camera, there is no other better example than the Micro Four Thirds family from Panasonic and Olympus, although others might want to pull in Samsung and Sony into the mix, but I would say that the two Japanese giants are at the front of the race at the moment. 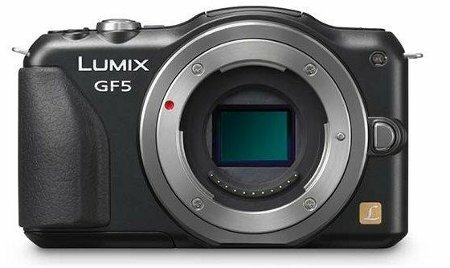 Having said that, Panasonic continues to work hard to remain at the top of the pack with the Lumix DMC-GF5 camera being announced. This is the latest interchangeable lens system camera from Panasonic that will feature a newly developed 12.1-megapixel Live MOS sensor and redesigned Venus Engine, ensuring that you will end up with stunning results that resemble true-to-life images that boast of exceptional resolution, image rendering and color reproduction. It does not matter if you are shooting in low-light conditions, as they boast a maximum 12800 high ISO sensitivity. The Panasonic Lumix DMC-GF5 will come with a noise reduction system that include a combination 3DNR (3D Noise Reduction) and MNR (Multi-process Noise Reduction), paving the way for both bright areas and dark areas to be faithfully reproduced with minimal noise in high sensitivity image recording. A sophisticated and stylish design ensures that heads will turn whenever you whip out your Lumix GF5, while Panasonic is also thoughtful enough to throw in a rubberized grip so that even if you suffer from sweaty palms, it is a whole lot more convenient to hold the camera with but a single hand. Since it complies to the Micro Four Thirds standard, you can be sure that (depending on your budget) you will be able to gain access to a wide range of interchangeable lenses so that your photos will turn out brilliantly – assuming you have the technical know how and skill to capture those precious moments. Want to record video in full high definition resolution? That is not a problem, since the Panasonic Lumix DMC-GF5 will also feature a dedicated video recording button so that you need not interrupt your photo taking sessions. You can select from black, white and red shades when the Panasonic Lumix DMC-GF5 arrives later this year, and there are two kit options to choose from. The body with 14-42mm standard zoom lens will retail for $599, while those who opt for the body with 14-42mm power zoom lens will have to work harder and save up $749.